Two years ago at a second tier track in a state known more for its college sports stars than its equine athletes, a horse named Kelly Leak won a nondescript Kentucky Derby prep. Although it carried a healthy $900,000 purse at the time, the Sunland Derby wasn’t even graded (today, it offers an $800,000 purse and has been accorded Grade III status… go figure). Yet, in many ways, the lack of respect made sense. After all, since its inaugural running in 2003 until 2008, the New Mexico feature had sent a grand total of just one entrant – Sort It Out in ’05 – to the big dance on the first Saturday in May. In fact, calling it a Kentucky Derby prep was probably overly optimistic, if not downright silly. All that changed on March 29, 2009. Not because of Kelly Leak; after his victory in the desert, the son of Runaway Groom won just one of 11 subsequent starts — and that was an optional claiming event on the turf at Santa Anita. No, the horse that gave the Sunland Derby the legitimacy that prize money alone could not was Mine That Bird. After finishing fourth at Sunland Park, the little horse that could shocked the world with a stunning victory at Churchill Downs, paying $103.20 to win — the second-highest mutuel return in Kentucky Derby history (Donerail paid $184.90 in 1913). Now, I must admit I was as stunned as race caller Tom Durkin when Mine That Bird crossed the wire first in the 2009 Run for the Roses. But I didn’t think it was a fluke… well, at least not after some time had passed and I was able to process what I had seen. In the heat of the moment, I was willing to believe nearly anything. In fact, in the hours and days following Mine That Bird’s 6 3/4-length Derby romp, my faith in logic and reason was so shaken that I was on the verge of helping O.J. Simpson find the “real” killer of his ex-wife Nicole Brown Simpson and Ronald Goldman. I watched “Baywatch” that evening and found the plot riveting. In short, I was really messed up. However, I soon realized that the 2009 Kentucky Derby result was not as improbable as it first appeared, nor was the Sunland Derby that year the horrible prep that I initially believed it to be. 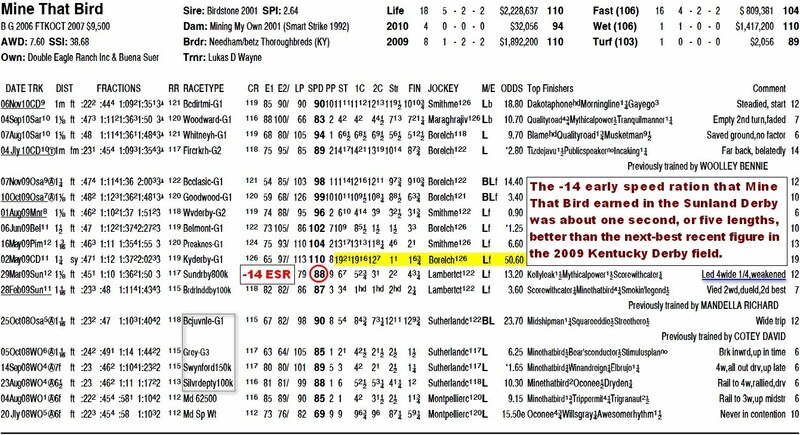 One thing the ’09 Sunland Derby featured was an incredibly fast pace — and Mine That Bird contested that pace while racing four-wide on the final turn. In fact, the son of Birdstone’s -14 early speed ration (ESR) in New Mexico was the best such recent figure in the entire Kentucky Derby field. 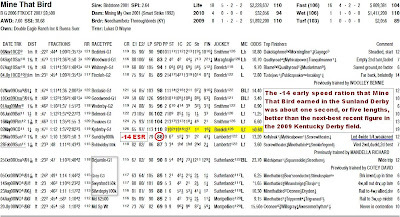 True, the gelding’s speed figure in that race was on the light side (just an 88 Brisnet speed figure, well below the 107 Kentucky Derby par), but that was obviously due to the blistering early splits. Look familiar? To me, the similarities are startling — right down to the weak overall speed figures that both horses display. The only difference is that the Sunland Derby was Mine That Bird’s final Kentucky Derby prep, whereas it was Astrology’s first. In any event, you can bet I’ll be keeping a close eye on the son of A.P. Indy when he makes his next start. Who knows, the winner of this year’s Kentucky Derby may be written in the stars. This weekend, the third and final Kentucky Derby future wagering pool will be offered through TwinSpires.com and other venues. Visit www.twinspires.com/content/kyderbyfuture3 to get free past performances for all of the pool contenders.